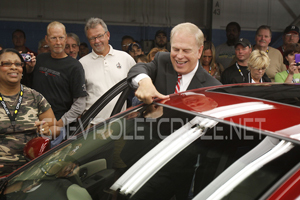 Ted Strictland, Governor of the State of Ohio, pressed an inked thumbprint against the roof of a red Chevrolet Cruze on Wednesday to kick off the first of GM’s newly produced Chevrolet Cruze which is made in Lordstown, OH. 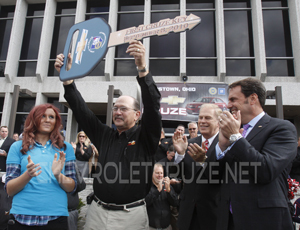 Strickland and General Motors North America President Mark Reuss drove the red Cruze off the end of the assembly line followed by a white & blue models driven by members of the Cruze launch team. 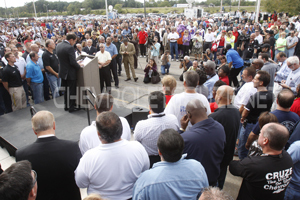 The crowd applaud as Reuss started up the Cruze and drove it off the assembly line. 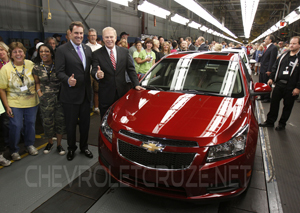 The Chevrolet Cruze will begin delivery to Chevrolet/GM Dealerships across North America, later this month.